This mid-century modern home designed by Harris Armstrong for Dr. and Mrs. Evarts Graham in 1941 is now for sale. 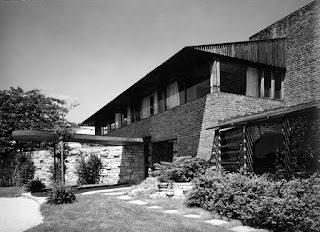 This example of Armstrong's maturing style combining stone, brick, wood and glass creates a modern vernacular in consonance with the natural Missouri landscape. View of entrance from southeast. Click here for real estate information. 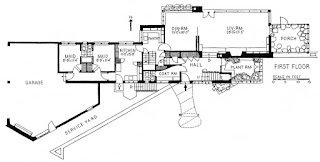 Armstrong’s 1941 design for the Graham Residence is architecturally striking in its variety of formal references, contrasting materials and attention to craftsmanship. The home’s overall simplicity in form and massing, especially when viewed from a distance, contrasts with a masterful attention to detail, manipulation of shade & shadow and use of natural materials. Textures, colors and forms interweave creating a natural palette with the intricacies of an ancient masonry structure almost on the verge of being overtaken by vegetation. 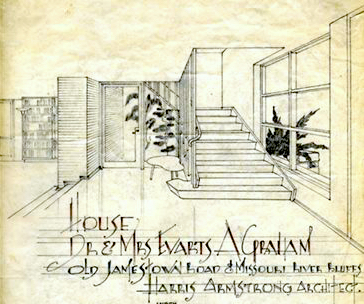 The house is an Armstrong masterpiece epitomizing his ideas on creating a modern vernacular appropriate to Missouri’s climate and culture. From afar, the house is minimal to the extreme, but as one approaches, its richness gradually reveals itself. The choreographed circulation sequence offers layers of anticipation, wonder and surprise as one enters and passes through its variety of spaces. The main body of the house is regular and rectangular with shallowly pitched overhanging roofs. The lines emphasize the horizontal reflecting and reinforcing the dominance of the surrounding prairie. The structure extends to the east and west with its main elevations facing toward the south (addressing the road) and the north (overlooking the Missouri River). The composition is strongly horizontal and solidly anchored in the landscape. The site offers the benefits of bluffs high above the river which overlook the low-lying areas of the confluence of the Mississippi and Missouri in the distance. South elevation facing Jamestown Road. The primary exception to the home’s rectilinear form is the large angled stone wall leading to the main entrance and screening the garage and service yard. This heavily rusticated limestone wall screens the “service” areas of the house from view as one experiences the house from the standpoint of its long driveway. This solid mass is relieved only by the introduction of climbing plants and vegetation. A narrow vertical slot offers access to the linear service yard situated between the hidden five car garage and the massive limestone masonry wall. While the wall offers monumental facade, it is no veneer of stone set out just to impress the public; it is a full thickness stone masonry exposed on both faces. Carefully composed entrance below organic canopy. 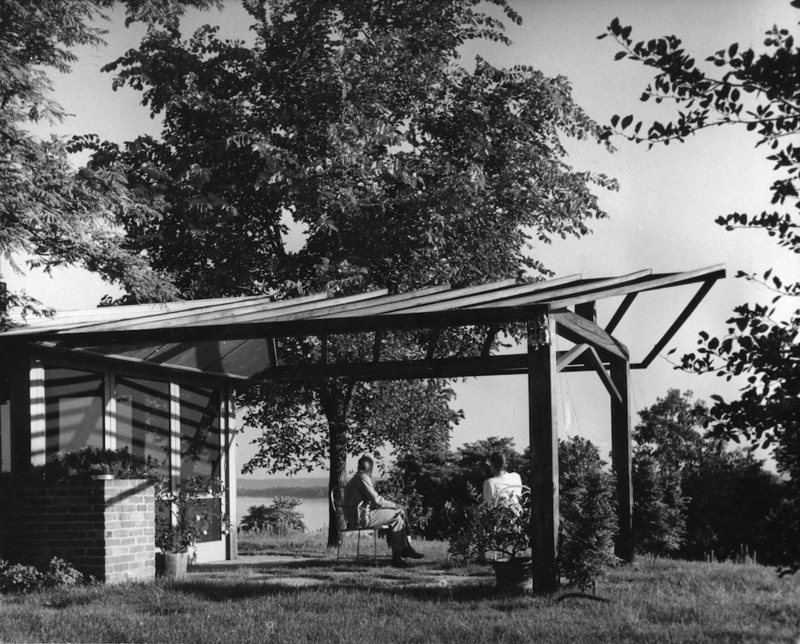 The entry canopy is a significant departure from the unsupported cantilevered roof which had been a signature element of Armstrong’s work during the 1930s. 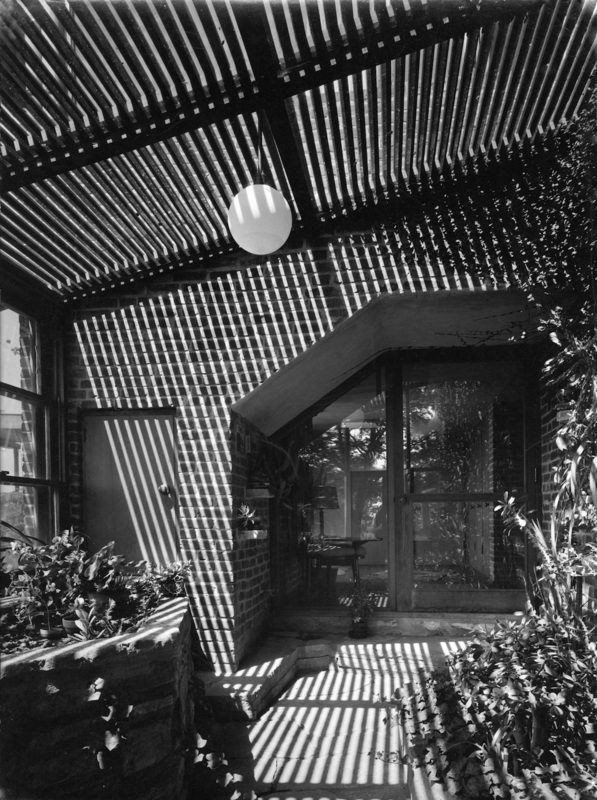 Here the entrance canopy is organic and emerges from the body of the house as a living appendage. Its pair of wooden supports are tilted and have vines trained to climb them. This wooden projecting canopy may have been inspired by the work of Finnish architect Alvar Aalto. 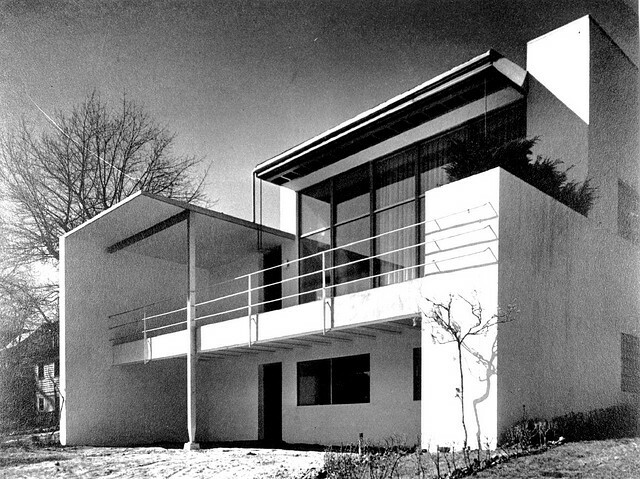 In particular it seems inspired by his design for the Villa Mairea of 1937–39. This ground breaking house blended elements of modernism with traditional Finnish construction and other vernacular formal references. 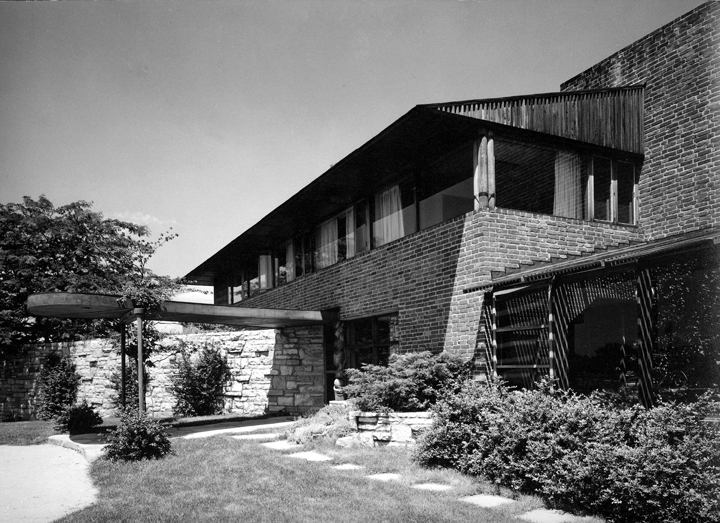 In Armstrong’s design, the roof and the overall house massing is emphatically horizontal and expansive. The most pronounced aspects of the fenestration are long bands of glazing. These horizontal bands wrap the corners offering the house a floating open aspect that functions from the interior as well as the exterior. 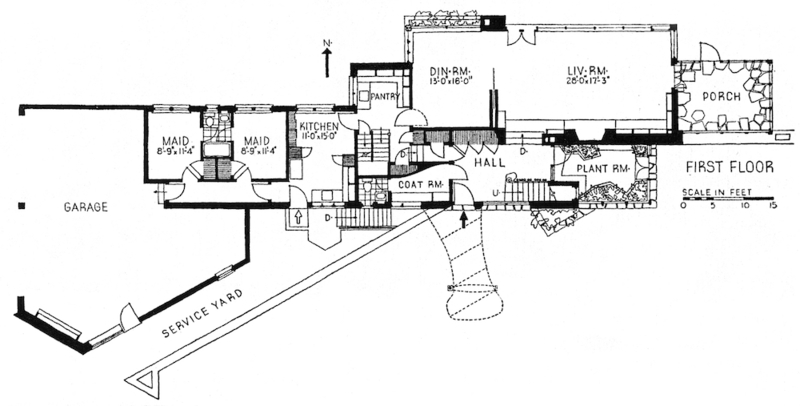 Floor plan as published in the 1940s. The surprisingly spacious garage (for that time) is concealed visually from the drive, yet emphasized by its flat roof which contrasts the shallow pitched roofs over the home’s living spaces. The rugged limestone stone with irregular coursing simultaneously conceals and announces the presence of this portion of the house. The blank wall’s angle guides the visitor toward the main entry. 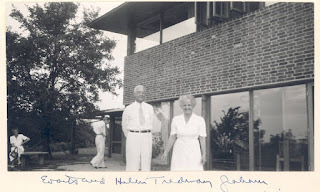 Dr. and Mrs. Graham at their home. 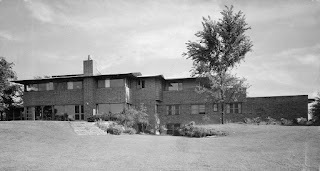 The construction of the house is relatively unusual altogether based on the home’s date. There was little construction going on at the time because a great deal of materials and labor was being diverted to the war effort. Dr. Evarts Graham’s position at the Washington University School of Medicine was as the head of the Department of Surgery from 1919 through 1951. His career as a surgeon and researcher was without parallel. He performed the first successful removal of a cancerous lung in 1933 and proven correlation between cigarette smoking and lung cancer in 1950. 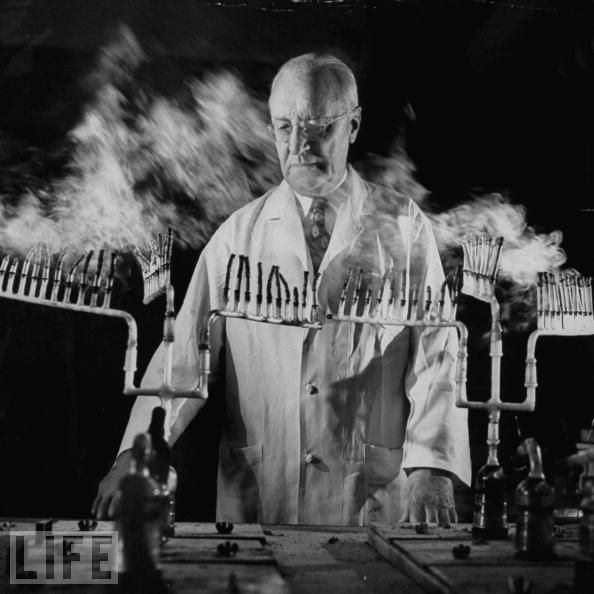 Dr. Evarts Graham as depicted in LIFE magazine. Many of Armstrong’s early clients were prominent in medicine. His Shanley Building of 1935 for Dr. Leo Shanley was the first International Style building constructed in St. Louis. His cubic modernist brick home for Nobel Prize winning couple Carl and Gerti Cori was designed in the same year. The Cori’s were associates of Dr. Graham at the School of Medicine. These works and associations lead to his commission to design the school’s Cancer Research Center in 1950. 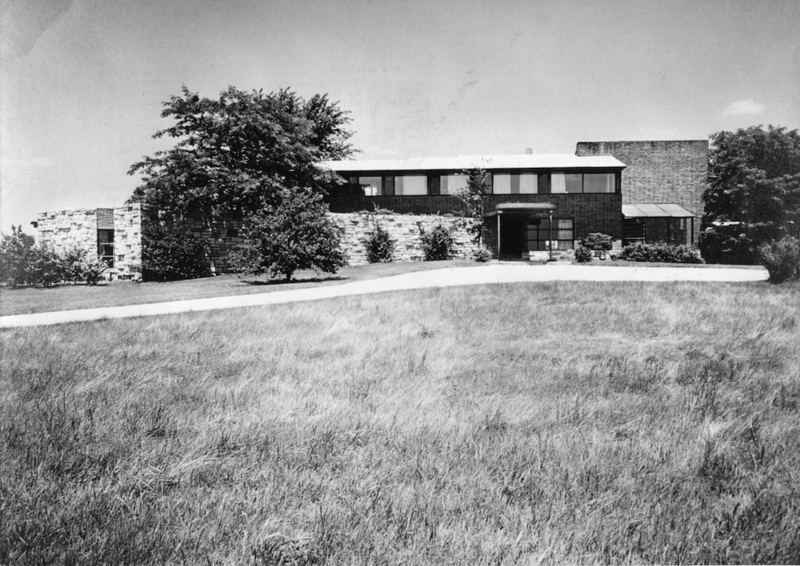 Armstrong's award-winning Shanley Building of 1935. The house’s front elevation which faces south presents a striking image. The contrast of dark and light surfaces is most prominent. The brickwork of the main volume contrasts significantly with the whiteness of the angled stone wall. A massive brick plane at right encompasses the main chimney and acts as a visual foil to the rest of the house. It beyond the limits of the interior space and was designed to standout from the body of the house. This wall divides the smaller spaces at the front of the house from its rear where floor-to-ceiling glazing wraps the living room opening the house to the impressive view of the river beyond. 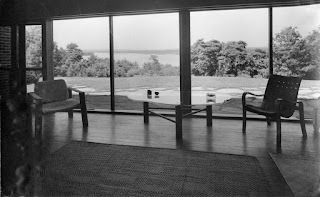 Interior view looking north toward the Missouri River. The home’s rear elevation is simpler than the front being composed almost exclusively of brick and glass. Sharply extending roofs hover over the two story portions of the house. The body of the house zig-zags from east to west and the roof follows suit. The view of the garage is largely concealed and minimized except for visual hint offered by the cantilevered roof extending west. North elevation overlooks Missouri River. The horizontal glazing is dramatic without clear expression of structural support for the brick masses except upon closer inspection. 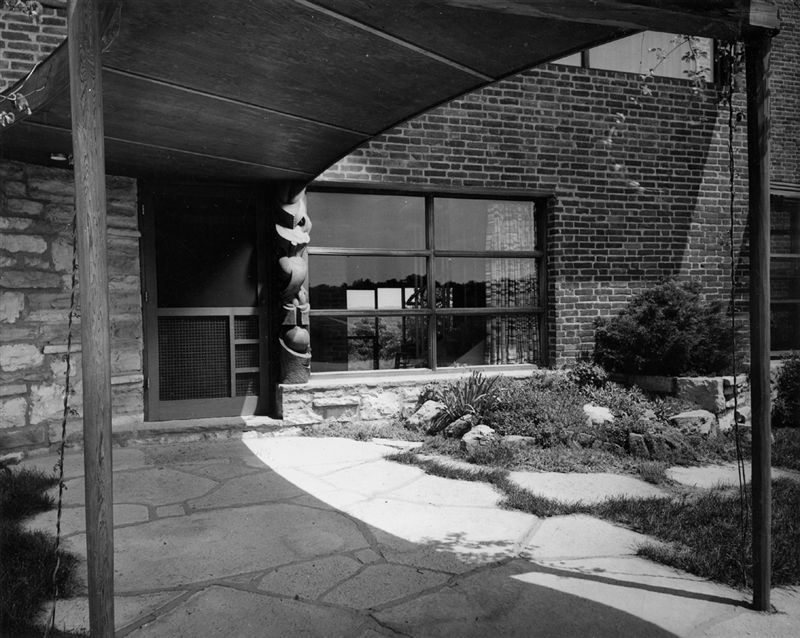 Steel columns supporting the concealed lintels which are wrapped with four wood cylinders in a bundle not unlike columns at Aalto’s Villa Mairea. The attached greenhouse interior is striking its complexity and attention to natural lighting. His playful use of brick, stone and plants is evident. Armstrong focused a great deal attention on angle light would strike his buildings. He would have them photographed at particular times of day to emphasize the shadow lines which had been carefully conceived. 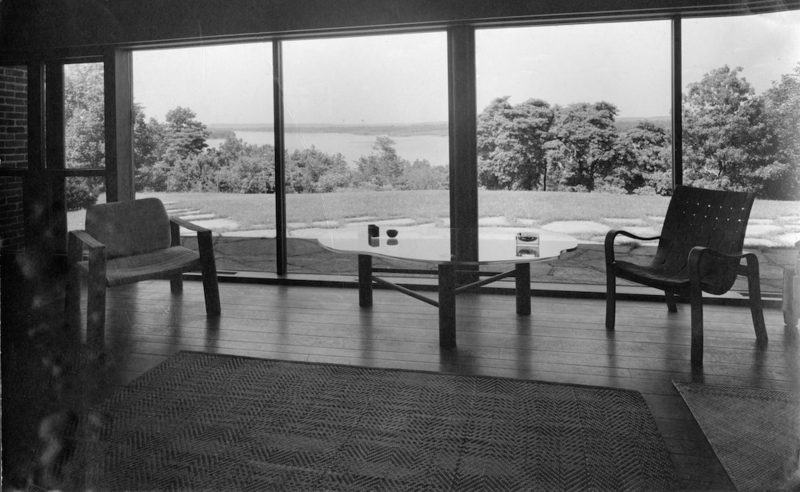 The design of the open framed pavilion beyond the screened porch at the east offers a dynamic outward thrust with commanding views of the landscape to the north, south and east. 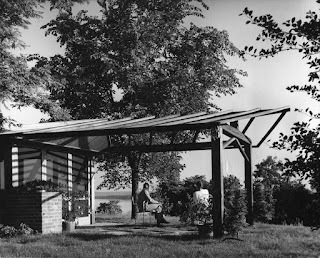 The photograph of Dr. Graham with his accomplished wife, Helen Tredway Graham, is touching in the way it shows the two of them ensconced by the timber wood pavilion framing them in the natural landscape. They were each major forces in the development of 20th century medical research and health advocacy. 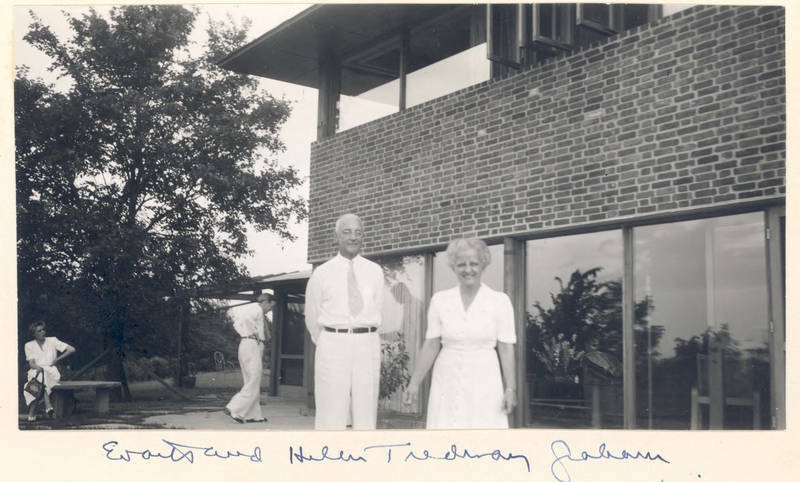 Evarts Ambrose Graham and Helen Tredway Graham.